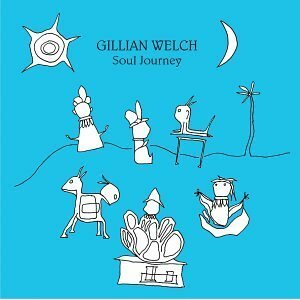 3rd June 2013 is the tenth anniversary of the release of the album Soul Journey from Gillian Welch. Gillian Welch, an American singer-songwriter, performs with guitarist David Rawlings – he also has donned the producers hat working on albums from artists such as Welch to Old Crow Medicine Show. * Time (The Revelator) – 2001 – received a Grammy Award nomination for Best Contemporary Folk Album. * Soul Journey – 2003 – saw the introduction of a more upbeat sound to their body of work with electric guitar & drums. Gillian Welch’s career in 2002 received a boost in profile via her contribution to the film soundtrack Oh Brother Where Art Thou? ; alongside other American country music artists such as Emmylou Harris and Alison Krauss. Welch and Rawlings came to be known as leaders of Nashville’s alternative country community, due to the responses garnered from critics and fans, for their albums Time (The Revelator) from 2001 & Soul Journey. Growing up, Welch was introduced to the music of folk singers such as the Carter Family, Bob Dylan and Woody Guthrie which resonates throughout Soul Journey; which could be described as Dylanesque, as the album contains less camouflage between herself and the songs, with Welch’s lyrics encompassing themes of identity and family. Recorded at Woodland Sound Studios, RCA Studio B and at home.